Looking to do some Off-Road cycling in Irelands Ancient East? Do you just happen to be looking in Wicklow? 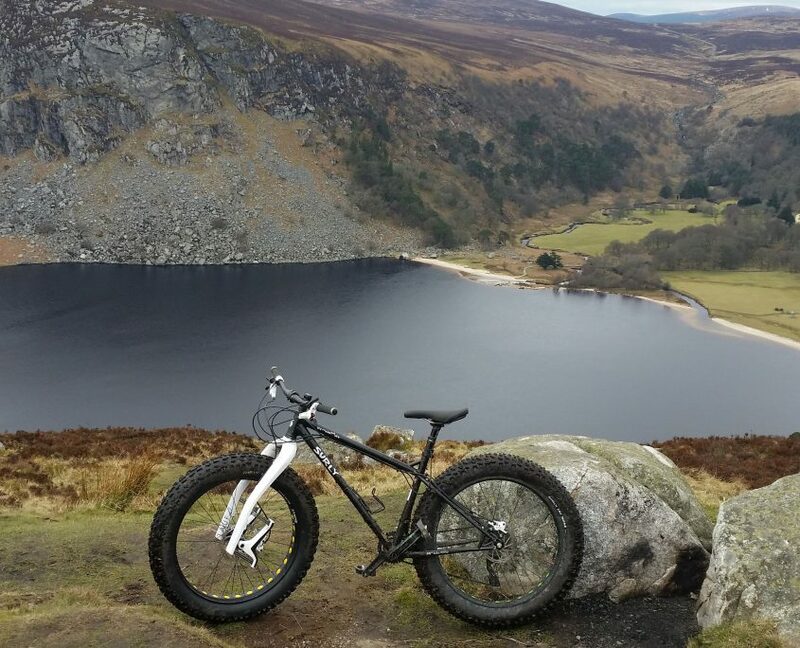 Bike Hire Wicklow is just one of the services offered by Fatbike Adventures who specialize in off road guided cycling tours, fatbike, mountain bike, road, commuter & kids bikes upgrades sales and servicing. Bottom bracket and headset bearing replacements, tubeless tire conversions, puncture repair, gear indexing, brake repairs, wheel building, bike upgrades, bike part replacements, general bike servicing, cable replacement, brake bleeding, dropper seatposts are just a few of the things that Fatbike Adventures would be only too happy to help you with. Bike hire, bike tours, self guided bike packing tours and bike rental is something we would consider doing with our repeat regular and customers. We wouldn’t do this for just anyone we don’t know because we pride ourselves in providing our customers with the very best in cutting edge technology on our rental fleet of fatbikes and we need to be sure that the people we trust with our bikes will love them and treat with the same care that we do. Lauf Forks – The Trail Racer, Boost, Carbonara and Grit forks are superbly engineered leaf sprung suspension forks featuring a 5 year manufacturers warranty, zero yes absolutely zero servicing and incredible performance. The Grit fork was recently judged to be the Best Innovative Product award at both the 2016 Interbike and Eurobike trade shows, it is considered the best upgrade to come into road, commuter and cyclo cross biking in many many years, read a review on the Grit here. Tumble & Fall – Have created a niche for themselves in the mountain bike lighting market with the Pro1600 and Pro2000 lights over recent years, read the review on the Pro2000 here. Both models have now been superceded by the new Halo. The Halo is set to break all boundaries by being both a commuter and mountain biking light, combine this dual functionality with a highly competitive price and a hefty 2 year warranty and you have a true show stopper. Pyga Industries – The brainchild of Patrick Morewood, formerly of Morewood Bikes, the Pyga brand stands head and shoulders above the rest. Impeccable build quality and best in class geometry makes any of the Pyga bike models out perform their competition and be amazingly good fun to ride. REEB Cycles – Straight out of ColoRADo USA and working hand in hand with sister companies The CycleHops Cantina and Oscar Blues Brewery the REEB hand welded frames are a true work of art. The REEB Donkadonk fatbike is in a class of it’s own, available in either Tru Temper OX platinum or Titanium tubing this puppy is as tough as nails and can tackle any terrain. Rocky Mountain – Straight out of Canada, not only are Rocky Mountain nice people to deal with, they make truly fantastic world class off-road machines. Check out the Blizzard fatbike and prepare to amazed. Rohloff – It’s no coincidence that we have chosen to represent the Rohloff products. The Rohloff internal rear hub has truly revolutionized bicycle gearing, extremely low maintenance i.e. an annual oil change and your bike gears are virtually bullet proof. Use this in combination with the Gates Carbon Drive and make your pride an joy even less hassle. Nextie – Lightweight tough as nails carbon wheelsets with a 3 year warranty are unheard of. Nextie are the next best thing to sliced bread in the biking universe. Fatbike Adventures bike tours are designed to be relaxed, enjoyable and can be either a 3 hour half day, a 6 hour full day or overnight. We would be only too happy to work with you to plan your very own bespoke biking / bike packing trip, please contact us with your idea’s here. Fatbiking – Beaches – Beer – Burgers – What’s... Fit enough to ride a bicycle on a beach?